For more information regarding this event, please email medevent@soton.ac.uk . 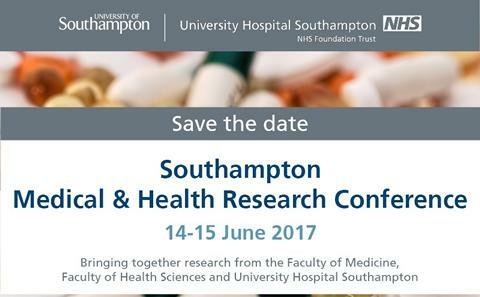 The annual Southampton Medical & Health Research Conference will take place at University Hospital Southampton on 14th and 15th June 2017 and brings together research from the Faculty of Medicine, Faculty of Health Sciences and University Hospital Southampton. Showcasing the breadth and quality of research being carried out by postdoctoral researchers, postgraduate research students and clinical academic trainees. A two day Conference celebrating collaborations between research staff across the University Hospital Southampton and the University of Southampton’s Faculty of Medicine and Faculty of Health Sciences. The Conference is an opportunity to engage with a wide range of health topics, presenting work carried out by our postgraduate and early-career researchers. The Annual Wade Lecture this year will be given by Dr Jeremy Farrar, Director of the Wellcome Trust. The Conference will take place on Wednesday 14 and Thursday 15 June 2017, in Lecture Theatres 1 & 2, South Academic Block, University Hospital Southampton. Please note that your registration can be for part or for both days of the Conference and includes attendance at the Annual Wade Lecture on 14 June 2017.